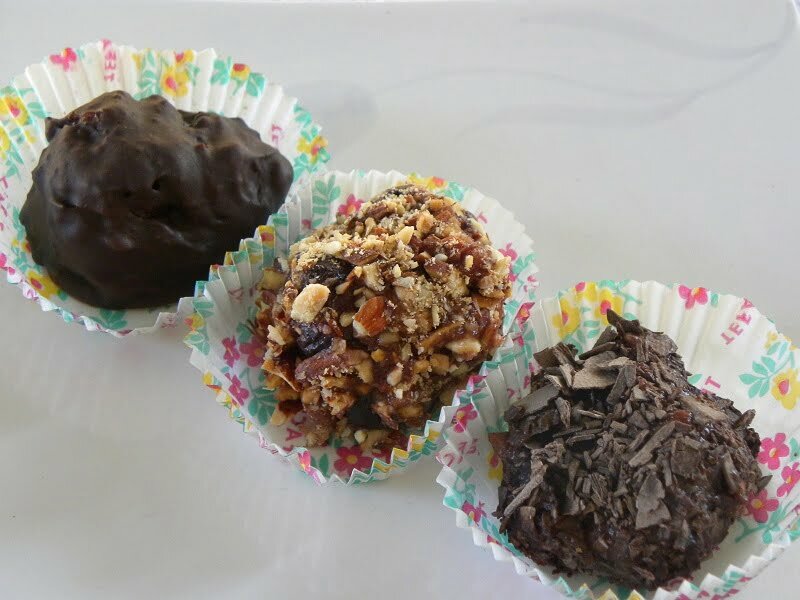 Truffles are bite-sized chocolate confections, usually made from chocolate and cream (ganache) usually formed in a spherical, conical, or curved shape. In Greecek we usually make the truffles with leftover cake or biscuits, which we smash into smaller pieces and also add some toasted nuts or fruit preserves. We then shape them into small balls and coat them with chocolate ganache or with cocoa powder, chocolate shavings, sprinkles, shredded coconut, toasted nuts etc. Christmas and New Year’s Day are not very far away and during the Christmas holidays we cooked and prepared lots of sweets and savory dishes. After seeing the event of Tuesday leftovers to search our pantries or cupboards and create things from our leftovers I realized how many things I could have prepared out of the leftovers and definitely there were more than one thing I could have put together. With most of the ingredients I saw in my cupboards I knew immediately what to make. I had leftover sprinkles from my Kaleidoscope Cookies and I had leftover biscuits, walnuts, almonds, chocolates, spoon sweets and rusks. I also checked my fridge and saw there was heavy cream and butter, so that I could make the ganache. Since the theme was chocolates the first thing that came into my mind was to make truffles. I always have spoon sweets (fruit preserves) which I make during the year with seasonal fruit. For example, now I am in the process of making bergamot spoon sweet, which is fantastic with all that aroma, which I hope to keep some for next Christmas to use in my Christmas cake. I made these truffles another year, using leftover Christmas kourabiedes, melomakarona and cake. Truffles are bite-sized chocolate confections, usually made from ganache and cream. Leftover cake or cookies can also be added to make this confection. Roast almonds in a preheated oven to 180 degrees C for ten minutes and then add the walnuts and roast together for ten more minutes. Whilst they are roasting, whip the heavy cream with icing sugar and when peaks form, refrigerate until ready to use. Beat the butter with sugar until creamy and gradually add the orange liqueur, vanilla and cocoa powder until the mixture is nice and fluffy. In a food processor add some biscuits and coarsely grind them. Powder the rusks or use dried breadcrumbs. Put them in a bowl and mix in a few tablespoons of whipped cream. When the almonds and walnuts have cooled, coarsely cut or grind them. Add them in the bowl. Drain the spoon fruits and cut them into small pieces. Mix all the ingredients together and start adding the butter mixture until the mixture holds together. Shape them and refrigerate until they become hard. In a bain-marie melt the chocolate, add butter, and mix until they melt. Add some of the whipped cream and mix until it becomes creamy again. Remove the pan from the hot water and set aside until it cools. Dip the balls in the chocolate and place on parchment paper or on a wire rack until the chocolate becomes firm. For the remaining biscuit balls place some orange (or other) liqueur in a small plate, wet the balls and then roll them in sprinkles, crushed nuts, cocoa powder, coconut etc. If you make them during summer, it is best to refrigerate them before serving. Bravo, the array of Truffi look like they are about to be eaten! Thanks Foodie Pam and Peter. Trufas are one of the things I learned to do when I was young in a kitchen course! I have problems to stop eating them! Ohhhh, do you call them troufas in Spanish because we also call them troufa in Greek but for plural we say troufes?